Erasmus University Thesis Repository: Creating attractive neighbourhoods. Framings of gentrification and participatory neighbourhood development processes in Oude Noorden. In Rotterdam gentrification is pursued as a strategy to create attractive residential neighbourhoods and a strong urban economy. Because cities are becoming more complex, more actors have stakes and are therefore involved in urban development processes. Concerns about how places support certain ways of life or businesses makes the qualities of place important. There is a need to know more about how gentrification is perceived by the users of the city, what kind of development processes the users are involved in and how the users understand the improvement of place qualities in their neighbourhood. 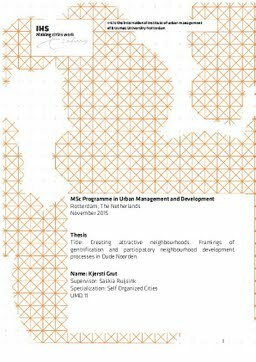 In order to get more knowledge about these topics, a single case study research with an explorative approach was conducted of 13 typical urban development processes in the neighbourhood Oude Noorden in Rotterdam. The area was identified as an gentrifying area by experts. The data collection method was qualitative interviews of 15 various stakeholders and observations in two participation meetings. The first finding was that the stakeholders´ general idea of gentrification taking place in Oude Noorden was divergent from the dominant academic one which relates gentrification to displacement of lower income resident. The second finding was that the recent urban development processes could be classified in five modes of participation where the multiple stakeholders pursued different aims and played different roles. Thirdly, the reseach showed that the stakeholders assessed social, symbolic and physical improvements of place qualities resulting from the various modes of participation. Finally, in the stakeholders´ evaluation of the place qualities resulting from one of the modes of participation, all the nine aspects of gentrification were reflected. In the other four, only one aspect was occurring. The conclusion is that the symbolic language of the gentrification strategy in policy and practices in Oude Noorden eludes the negative consequences for the lower income population. The recommadation is therefore to address the non-neutrality of the concept into the political and academic debates and to bring evidences forth. Further, the urban development processes in the complex city are involving multiple stakeholders in more collaborative ways. The classification of five modes of participation is just a start to identify the possibilites and constrains in this kind of urban development. Knowledge can be enriched from literature and research practice in the fields of governance, self-ogranization, complexity cities and urban planning. To increase the perspectives and reflections on how residents and other users assess and improve place qualities in Oude Noorden or elsewhere, a more comprehensive research that includes the missing stakeholders and the spatial quality dimension that were not approached in this research is recommended.